The beautiful Stroller is integrated with redesigned box, detachable hood with visor. This is the three dimensional folding system, super compact, wheels with suspension. Containing spacious basket and washable holstrey. With multi-position seat recline, the child can adjust/ sit to a preferred comfort level. The stroller is hooded with a canopy that has a peek-a-boo window to keep a watch on your baby. This also keeps away sun rays or wind from your child. The lockable front swivel wheels ensures smoother ride with superior suspension on stroll. Easy and practical, Graco's one-hand fold lets you fold your pushchair in just one quick, easy movement, even whilst holding baby! The one-hand seat recline system enables you to recline the backrest quickly and easily with just one hand leaving your other hand free! 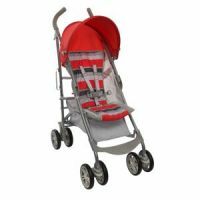 To Recieve updates and possible rewards for Graco Nimbly Stroller Berry please sign in. To Recieve updates and possible rewards for Strollers & Prams please sign in.